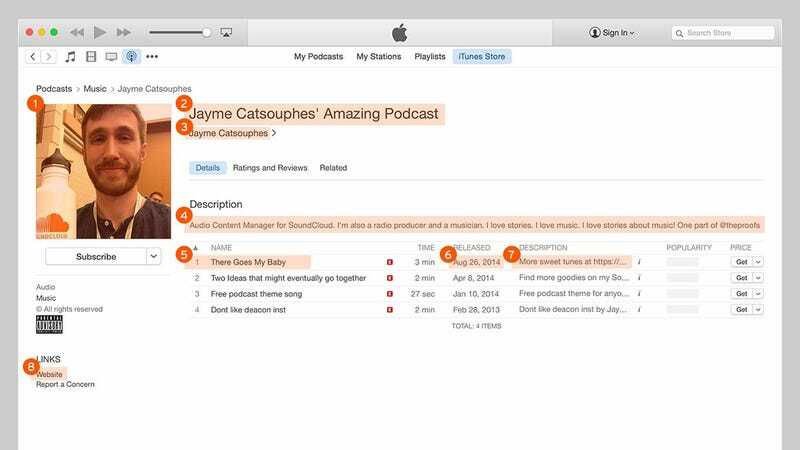 A couple months ago, SoundCloud opened its podcasting service up to everyone. There are limits to what you can do with a free account, but it’s a great way to dip a toe into the podcasting waters without spending any money, and you don’t necessarily need any in-depth technical knowledge. We’ll walk you through the process of getting your first podcast up and running. All you really need to start a podcast is a microphone or some kind of recording device you can connect to your computer—you could even use a recording app on your mobile. However, more expensive equipment will obviously lead to a better-sounding podcast. Long-time podcaster Dan Benjamin has a comprehensive guide to some of the kit you can pick up and there are plenty more guides out there. You’re also going to need an audio editor to cut out awkward silences and mix in music: Audacity is one of the best free options out there. SoundCloud users on a standard free account can upload up to three hours of audio every month, so it’s great for getting your podcast off the ground. If you want more, you can pay $55 per year for six hours of audio a month and $135 per year for unlimited uploads. First and foremost, get yourself signed up for a SoundCloud account—for your profile display name, use the name of your podcast. You only need to enter a few details to begin with, but you should head to the settings page to fill out your profile in full. Here you can enter an image (SoundCloud recommends one that’s at least 1400 x 1400 pixels), a description and website links for your brand new podcast. This metadata will go wherever your podcast goes (RSS feeds, iTunes and so on) so make sure it’s all correct. SoundCloud has a useful guide to setting up your profile. Switch to the Content tab to make more adjustments. Here you can set a category and language for your podcast, as well as a customized feed title (if you don’t set one here, your profile name is used instead). It’s a good idea to have your email address displayed as it’s a requirement for some podcasting apps. Tick both options under Upload Defaults. That’s it—you’re ready to start podcasting. Click the Upload button at the top of the SoundCloud interface to choose a file from disk or start a fresh recording inside your browser. Again, there are various fields to fill out to give listeners more information about the content: The description box should include the show notes for this episode. Make sure the Include in RSS feed option is ticked under the Permissions tab and set the social media sharing options as you like. Obviously you want the track to be public as well. If you need more help and advice, then SoundCloud has plenty of information to pore through on optimizing your recordings. Click Save and the content is uploaded. You can then submit your podcast RSS link (available from the Content tab of your profile settings) to various aggregators such as Stitcher and TuneIn. In iTunes, go to the iTunes Store and click Submit a Podcast on the front page of the Podcasts section. Keep an eye on your podcast stats to see how well it’s doing.